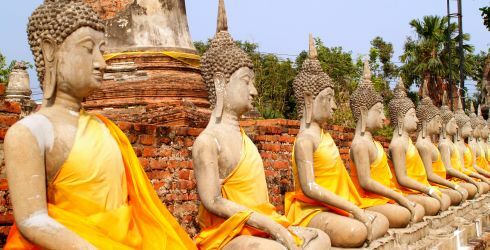 Group travel to Thailand is the perfect way to experience one of Asia's most popular tourism destinations. What's not to like: relaxing by the beach enjoying some laughs with your best friends, exploring ancient ruins and temples and sharing thoughts and experiences; sharing a meal family style and discussing your favorite foods from the local cuisine. Group trips to Thailand are a terrific way to have quality time with those friends closest to you, as well as experience the vacation of a lifetime, making memories you'll be talking about forever. Fact: If you enough people join you on your group trip to Thailand, the host of the group can travel for free. It's common practice in the industry to offer discounts or freebies to group organizers as thanks for bringing everyone together. As you likely know, Thailand has something for everybody. There's all the historic culture, but also modern conveniences like massages, beaches, and food. It is tempting to build a rigorous schedule to experience it all, but the group trips that are the most successful are those that offer a more flexible itinerary. Not everyone has the same interests, and everyone wants to feel like they saw everything; by building a schedule that includes both specific group experiences as well as independent free time to go exploring, everyone walks away with what may very well be the trip of a lifetime. Experience the highlights of the intriguing former Siam. From glittering temples, to traditional dancing and the fascinating culture of hill tribes, there is much to see and do in the Land of Smiles. Choose a special handcraft at a bustling market, relax under the hands of a trained masseuse and soak up the sun on one of the country's best beaches. View the complete day to day Thailand Grand Tour Itinerary. Enjoy bustling and vibrant Bangkok before switching gears to see another side of Thailand. The northern city of Chiang Mai has all the delights of Bangkok, but on a smaller scale. In addition to visiting a beautiful orchid farm, there is a unique opportunity to commune with those gentle giants, elephants, at an elephant camp. Learn the secrets of Thai cooking techniques and spices at your Thai cooking class, where you will sample the fruits of your own labor. After so much excitement spend the end of your trip relaxing on the beaches enjoying the sparkling water surrounding Phi Phi Island. View the complete day to day Taste of Thailand Itinerary.